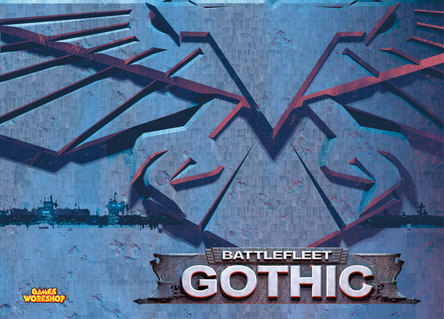 Battlefleet Gothic is Games Workshop’s sci-fi space combat game set in the world of Warhammer 40,000. It is a Specialist Games title and, like Epic Armadgeddon, is often overlooked by gamers. BFG is overall a very well done set of ship combat rules. It is fast playing and mostly well balanced (with the exception of the Eldar that most players feel are over powered). You can easily control up to a dozen ships on a side yet the game is still interesting with just a couple ships in play. The miniatures are generally well done, with the primary Imperial and Chaos ships available in plastic, and easy to paint. If you have an interest in sci-fi ship combat and you have not looked at BFG you should. To make this easy GW now has the rules available as a free download or you can still purchase the printed books (the box set does not seem to be available anymore). BFG continues to have a lot of online support. There is the official web-zine Warp Rift and the Port Maw forums are good places to start. In addition, the World’s End Radio podcast provided some recent coverage of BFG. Episode #9 – All Ahead FAIL has a nice overview of the game (forward to 52min to get right to the BFG material). The following Episode #10 – Seeing Stars has a look at some of the advanced rules as well as the various fleets available (jump to 34min in to get right to it). This entry was posted in Miniature Wargames, Sci-Fi, Warhammer 40K.